Cobourg Peninsula is peppered with stunning coves and beaches. So far, we’ve been inclined to listen to what Dave McMahon has to say to our group of five travellers. With his bare feet, Akubra and khaki stubbies, he looks every inch the bona fide bush guide, though it’s his seemingly limitless levels of knowledge – on local Indigenous languages, the area’s history, the regional bush tucker – that gives him credibility. It is day three on this safari through the Cobourg Peninsula, and thoughts of crocodiles – along with actual crocodiles – have accompanied us at almost every turn. 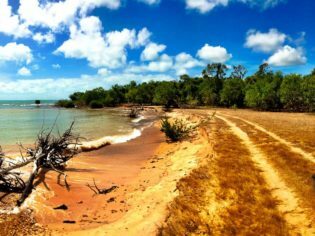 Since arriving here, in this pristine area of wilderness some 570 kilometres north-east of Darwin, a handful of croc-friendly rules has been established: no getting closer than two metres to any shoreline. No hands over the side of boats. Absolutely no swimming. The croc-awareness also extends to our accommodation; semi-permanent tents positioned on the edge of a small cliff which are – in theory – too high for them to get to. If ever you’re planning a visit to this 2100 square-kilometre region of wilderness, things like this are good to know. Cobourg is protected by Gurig Gunak Balu National Park, the first in Australia to be managed jointly by the area’s traditional owners, and thus has had the good fortune of remaining almost perfectly untouched since European settlement. No more than 30 people live in this entire region. There are no nearby towns. No mobile reception. Indeed, if you’re planning to camp here – something only 20 cars can do at a time – you’ll need to come well-prepared. There might be plenty of fodder for crocs in the area, but you’ll find no fuel, no water supplies, and definitely no supermarkets. Unless, of course, you’re with Dave. The guy is a regular Bear Grylls, full of survival knowledge both worthwhile, and not so much (“look, mangrove worms! They’re very high in iron… though they taste like rotting mangroves”), but he’s also here as our guide with Venture North, the only luxury 4WD business – indeed, the only business at all – to have been given permission by the land’s traditional owners to operate here. Only around 250 people get the chance to take this trip each year, co-owner Hugh Gange tells me later, and there are no intentions of ever increasing that number. A good thing; even if the ratio of buffalos/crocodiles/people seems somewhat alarming. To get to Cobourg, we must drive past the Mary River Wetlands System, arguably the Territory’s most beautiful wetlands… and an area with one of the highest densities of crocs in the world. The cruise we’ve stopped to take along the Corroboree Billabong, with Wetland Cruises, is a worthwhile detour. These wetlands are a documentary in motion: thousands of birds squawking and fluttering about; hopping and feeding and mating with no regard for us. Just then, a Black-Necked Stork (more commonly known as a Jabiru) comes into view. He’s all bright red legs and pin-cushion body, and I scramble closer for a photo. Indeed there is – no more than two metres away. He’s dead still with gleaming eyes. Cripes. On the way to Kakadu we slow down for a car with Victorian number plates, parked beside the highway. The driver is on the phone. “Probably calling 000 about the fires,” Dave chuckles. The regular bushfires can take some getting used to for non-Territorians, but the fact that they’re just that – regular – is precisely why they’re nothing worth worrying about. We stop en-route to Cobourg at the Maguk Pool in Kakadu. Dave keeps up the commentary as we get out of the car and start the one-kilometre trudge to the waterhole. Too right. Giant pandanus trees tower above us like a prehistoric forest, making our small group seem toy-sized in comparison. Leaf litter is strewn in the palms high above us. It’s hard to believe this was all underwater eight weeks ago. At the end of our trek is a worthy reward. The waterhole is a black oasis, framed by a verdant green brow of pandanus, ending in a dramatic escarpment from which a waterfall streams down. If we’re in God’s country, then this must be His swimming pool. It smells like fresh rain and scorched sandstone. Diving in feels like silk. “Thanks for letting us know that now,” replies fellow passenger, 70-year-old Trish, dryly. Cahills Crossing, a concrete tidal bridge passing over East Alligator River into Arnhem Land, has a few stories to tell. In 1987, local Kerry McLoughlin was reportedly fishing here when his line snagged. With six American tourists watching – they were there to cross the river – Kerry waded into the river to retrieve his lure. Unfortunately, he never made it out. Tourist photos show he was decapitated by a five-metre croc. Only his lower half was recovered. But Cahills is significant for another reason. 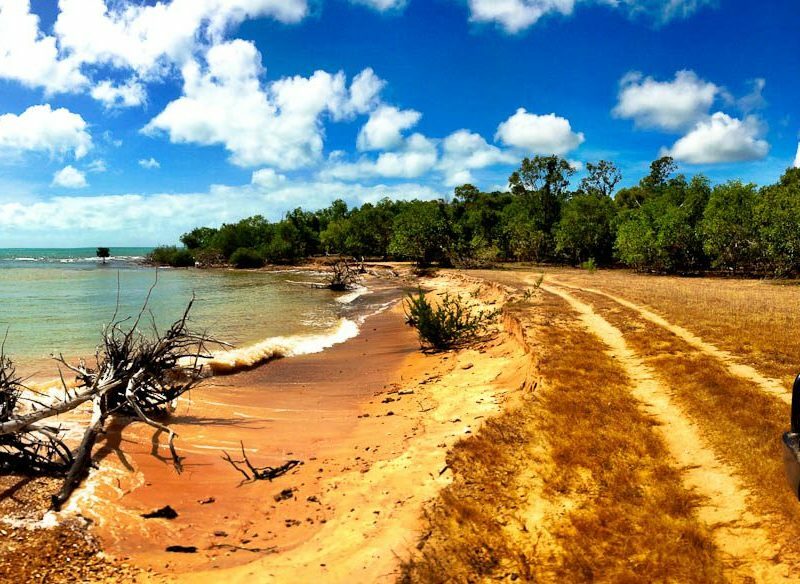 As we drive through the water into Arnhem Land, we’re crossing into a domain of Indigenous Australia; land that, for all purposes, is their home and not ours. Just to be here requires permission from the traditional owners. It’s also like crossing into the wild. Within five minutes of driving, big wild pigs appear on one side of the car. A herd of brumbies looks on from the other. Every animal is fat with health, everything around us is green. “Just another day in Arnhem Land,” says Dave. With its dusty streets and slap-dash houses, the town of Gunbalanya (formerly Oenpelli) is a far cry from inner-city Sydney, but some of the artists here, who sit barefoot outside the Injalak Arts & Crafts centre, have art on display at the National Art Gallery. We pick up local man Ezariah Kelly who takes us walking up nearby Injalak Hill, where a veritable exhibition of historic rock art reveals his people’s heritage. As Ezariah leads us to the finale of his tour – a lookout with a 270 degree view of Arnhem Land – he tells us of his culture’s struggles. The wind rustles through this place on the edge of the cliff, bringing sadness with it. I look at this young man, caught between two worlds, in his ordinary clothing, with his extraordinary history, and am lost for words. Change, indeed. To gain the permission required in order to bring people to their wilderness camp at Cobourg Peninsula, Venture North’s co-owners, Hugh Gange and his brother Aaron, had a circus-full of hoops to jump. It took a year to work out the contract, Hugh says over a beer, when we arrive at the Cobourg campsite that day. No less than three different governing bodies were involved in granting him permission, as well as four Aboriginal clans. “They needed to know that we would look after the land,” he says, simply. Hugh is wearing a sling over one shoulder, from which a joey keeps popping out. The tiny creature is an inherited legacy, Hugh explains, when he unavoidably hit its mother earlier in the year. As a qualified wildlife carer, he felt responsible to rear the joey into self-sufficiency. It is hard not to call him Bear Grylls, too. But Bear probably wouldn’t have liked the campsite Hugh and his brother run here; it’s far too comfortable. Meticulously clean, semi-permanent tents, outdoor showers among the eucalypts and an open wooden pergola and deck (with couches and a library in one corner) are among the highlights, though the champagne-ready, clifftop bar is the real standout. Before a roast dinner is served we watch dusk fall from the clifftop, sparkling in hand, while the fins of reef sharks slice through the water below. Over the next two days, Cobourg reveals itself to be a host of several unexpected idiosyncrasies. There is an old airstrip, built during World War II but never used. There is an obelisk, erected by the Royal Marines of Victoria Settlement in 1845, marking the Northern Territory’s highest point. There is a band of Tibetan ponies, directly descended from Gengis Khan’s horses, who still run about here… or so Dave swears. And there is Victoria Settlement. This sobering spot is mostly forgotten by history; remote remains of a town, which tell of a desperate time when an early British settlement turned into a nightmarish tale of malnutrition and malaria. Much of the stone masonry still stands, including marriage quarters, the blacksmith’s home and a kiln, though the hospital is by far the biggest building of all. “This was the busiest place in town,” Dave nods. As with any other peregrination from urban life, being here is a leveller; a place where modern concerns seem irrelevant and the realities of survival are just that. Cobourg has no astounding monuments, no spectacular tourist-ready formations; but this pocket of wilderness lacks for nothing. That night, as sleep drifts in through the gauze ceiling, I listen to the breeze; the soundtrack of peace. One can only hope that this land survives as the crocodiles have done. Getting there: Jetstar, Virgin and Qantas all fly to Darwin. Venture North will pick you up from your accommodation. Staying there: You’ll need to book accommodation for the night before and after the tour. We stayed at the Double Tree by Hilton, and it has generously-sized rooms, lots of natural light and friendly service. Need to know: Cobourg is remote, but relatively accessible for the fit and able-bodied of all ages. (The average age on our tour was around mid-50s to mid-70s.) Don’t forget a pair of sturdy walking shoes, sunscreen and a hat – it gets mighty hot. There is no mobile reception or internet availability at the Cobourg camp. You may get some reception at Gunbalanya, but only if you’re with Telstra. We recommend flinging your phone into a bag and forgetting about it. If you like a drink at the end of a hard day’s holidaying, you’ll need to pack one. The Venture North tariff is ‘all-inclusive’ (permits, food, petrol, accommodation, etc)… but no alcohol. There is one small bottle-shop to be stopped at along the way but prices are higher than normal and the selection is limited. Pre-purchase in Darwin. Bird watching: One third of all Australian bird species are found at Top End, and Cobourg is of particular significance; home to the first wetland in the world to be recognised for its global significance in the route of migratory birds. Some of the species we encountered were: the black-faced cuckoo, black-necked stork (‘Jabiru’), plumed whistling duck, red-tailed black cockatoo, royal spoonbill, eastern curlew, sooty oystercatcher, pied oystercatcher, straw necked ibis, Australian white ibis, glossy ibis, orange-footed scrubfowl, rose-crowned fruit dove, spangled drongo, crimson finch, great-billed heron, osprey, pied stilt, whistling kite, black kite, brolga, little egret, intermediate egret, great egret, cattle egret and eastern reef egret. Playing there: The Venture North five-day 4WD safari to the Cobourg Peninsula costs $3490 twin share.